I stumbled upon Garnier Pure Active Spot Fighting 24-Hour Moisturiser right after I ran out of my previous acne-fighting cream and it proved to be a good choice. 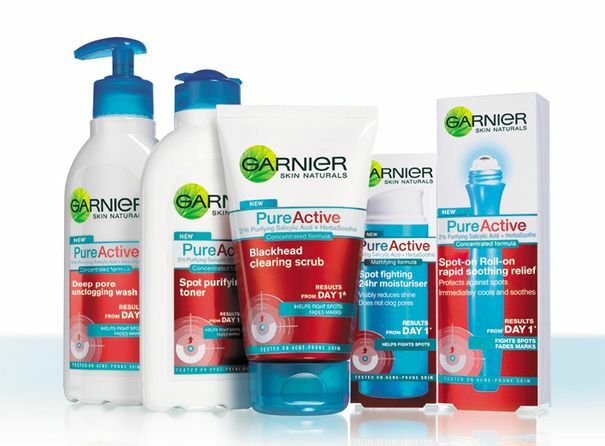 Garnier Pure Active is a new generation of concentrated formulae tested on spot-prone skin. Designed to protect against the appearance of spots and marks and leave skin looking and feeling purified from day one! Garnier Pure Active Spot Fighting is an effective moisturiser that helps fights spots before they appear. Moreover, it improves the skin’s appearance by hydrating it and visibly reducing shine. Enriched with Salicylic Acid, it helps to purify and mattify skin to protect against spots even before they appear. Use after cleansing every day morning and/or evening. Apply all over your face. 50 ml for around Rs. 325. Garnier’s cream absorbs quickly and soaks into the cells of my skin, leaving it smooth and fresh without a greasy feeling. It has a pleasant cucumber smell. Moreover, it is easy to apply, the container has the pump, which enables you to take as much lotion as you need without any fuss. The product fulfills its basic function, it mattifies and moisturizes the skin, preventing shine at the same time. I don’t have dramatic problems with acne, but it does reduce my rare outbreaks of spots by gently removing excess facial oils and improves the state of my skin in general. Although some users have said their skin dries out, mine has not. This clarifying lotion is very efficient and lasts quite long even when you use it twice a day. However, I noticed that after a few weeks, it is not as effective as it used to be. I almost ran out of it, so I recently switched to Pond’s and now I apply Garnier as a healing gel on occasional spots, this combination is fine for me. + Mattifies and moisturizes the skin. + Practical container with a pump. – After a few weeks, it is not that effective anymore. – In some cases, it might cause over-drying. 4.25 out of 5. Even though, I have seen some negative reviews online, this cream works very well on me. To people with severe breakouts, I would recommend thinking about getting the whole Pure Active series (wash, toner, scrub, cream and a roll-on) in order to gain the best results. emily the only thing I have liked from garnier so far is their tinted eye roll on pen. This one sounds quite nice though. I am just wondering why is it not working as effectively on your skin as it used to be? :clap: Great review and pics,Emily! Great review Emily- I had used a tube face wash from this range and it gavce a nice cooling effect!